Baratza Rescues My Starbucks Grinder… Again! The Starbucks “Barista” Coffee Grinder, the EL60, is the grinder that just won’t die. It was a present from my beautiful, amazing wife many years ago, and it has truly been a gift that keeps on giving. Now.. it’s survival isn’t just amazing because it’s really well made. It’s amazing because it continues to chug away despite years of abuse on my part! I’ve written previously about how Baratza helped me replace my broken hopper after the whole grinder took a nasty fall. This time, it turns out that my fundamental ignorance of how the thing works allowed me to neglect basic maintenance to the point that it became nearly unusable. Here’s what happened. One day not long ago, I dumped the coffee grounds from the EL60’s bin into my pour over and noticed that it seemed a little light. After years of doing this, I should’ve realized that my instincts were spot on and I was missing some grounds, but I didn’t think too much about it. That cup of coffee brewed up super quick, and was naturally quite weak. I still didn’t think a whole lot about it until I went on to brew the next cup, and ground up some more beans. This time, the grinder just didn’t seem to ever finish grinding. I’m so in tune with the sound of this thing that the pitch it generates when the RPMs spin up to their max is my aural clue that the grind is complete. So… I dumped the bin again, and this time I only got a few grounds and some powder. Powder is a problem. This grinder is known for producing a highly uniform grind… especially for a consumer unit sold en masse by Starbucks. So… I took the hopper off and peered into the grinder only to discover that there were still nearly untouched coffee beans in the works. Disassembly from there was a little harder than it should’ve been, mainly due to the aforementioned years of neglect. But… once I finally got the ring burr to let go of its grip on the holder for the main burr (below), I saw that the entire chamber was full of grinds and shards of beans. Right away I knew that the motor was fine. It was chugging away just perfectly. The burrs themselves were still sharp—after all, I was getting grinds that were what I expected… plus powder! So that meant that something mechanical was out of whack. 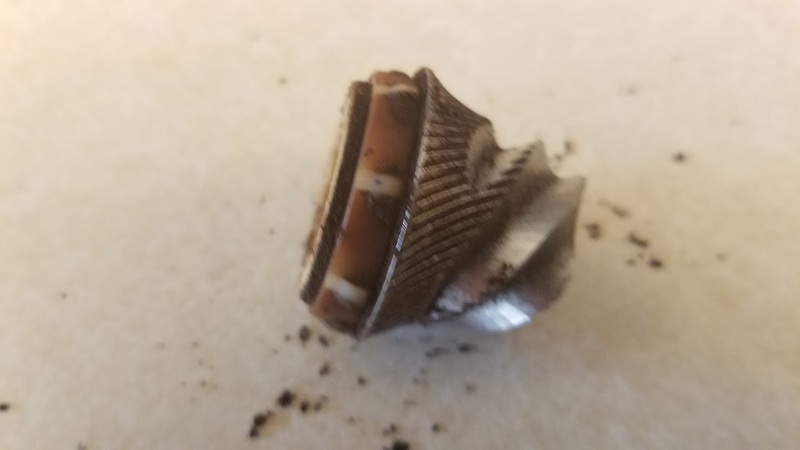 After spending several days cleaning out the grinder chamber with a butter knife after each grind, I decided to completely disassemble the machine and see if I could figure out what was going on. That little black component is a “door” of sorts, which opens to allow the coffee grinds to escape from the grinding chamber into the little chute which feeds the bin. As you can see, the “doorway” is jammed with grinds… and powdery ones. Since I’m grinding for a pour-over brewing method and not for espresso, you can imagine that I do not usually grind the beans to powder. So this was all quite mystifying to me. So… I did what had worked well for me in the past, and reached out via email to Pierce Jens, who has provided outstanding support for me in the past. I’ll get back to the story (and the fix for my grinder) in a moment. But first let me insert a couple of thoughts about Baratza. Baratza is a company I can get excited about. When I first needed help with my grinder some years ago, I was directed to Baratza by Solis, the European manufacturer that originally built my grinder, with instructions that Baratza was their US distributor and was responsible for support. It’s unclear to me whether Baratza had anything to do with the original deal that allowed for Starbucks to private label the Solis grinder and distribute it in the US under the “Starbucks Barista” brand when my wife bought this grinder for me many years ago. What is clear is that Baratza is currently the major supplier for Starbucks grinders, and that those grinders sold by Starbucks wear the Baratza label rather than a Starbucks private label. So… maybe they made a little money on the original purchase of my grinder, maybe they didn’t. Even if they did, they were a distant 3rd party to the transaction and were completely unknown to consumers like me at the time. In other words, they could have easily declined to expend any resources on supporting me with my grinder problems. This they did not do. Additionally, Baratza has advocated quite publicly for keeping grinders out of landfills, a message which, as a jaded marketer, I’ll admit to being a little dubious about. After all, it’s easy to talk about concern for the environment, and it’s another thing entirely to align one’s business practices around it. In the case of Baratza, I can tell you that they have proven to me through my interactions with them that repairing coffee grinders—whether to keep them out of landfills or to provide outstanding customer service or both—is something that their business practices fully support. OK… back to my story. 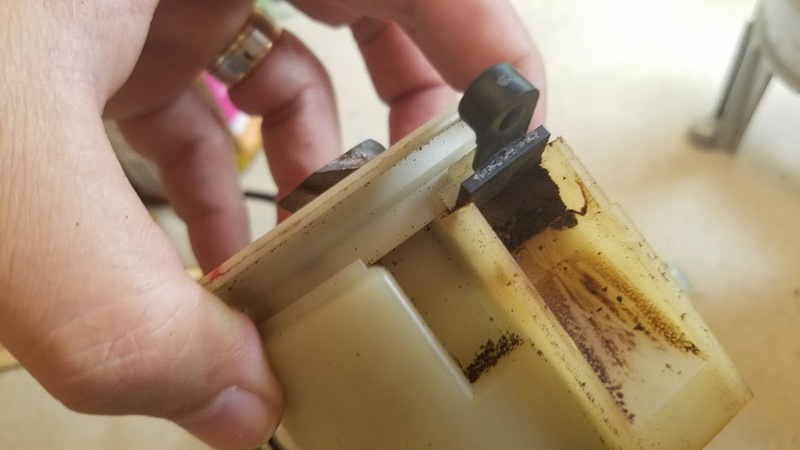 I found an old email thread from when Pierce Jens, who is a support technician at Baratza, helped me figure out what to do with my broken hopper, and replied to it, including the photo above showing my grinder jammed with coffee grounds. Thank you for your kind words! I’m always happy to help troubleshoot, let’s see if we can figure this out. I think you may simply have a worn out paddle wheel. Check out the 3rd picture of the Troubleshoot guide attached. None of the other pictures apply to your machine. You should have an 8 blade paddle, and I suspect yours is worn all the way out. I also have the paddle wheel replacement guide attached and the part is $5 on our Solis parts page. By the way, your write up about the hopper has made several fellow EL60 owners happy over the years: kudos for that! What was funny to me was that I had spotted the paddle wheel on the Solis Grinder Parts page on the Baratza website, but assumed that it applied to a different grinder than mine… because I didn’t recognize it! I knew right away that he was right. So… I placed the order. Within a couple of days, the new part had arrived and I disassembled the grinder once again. 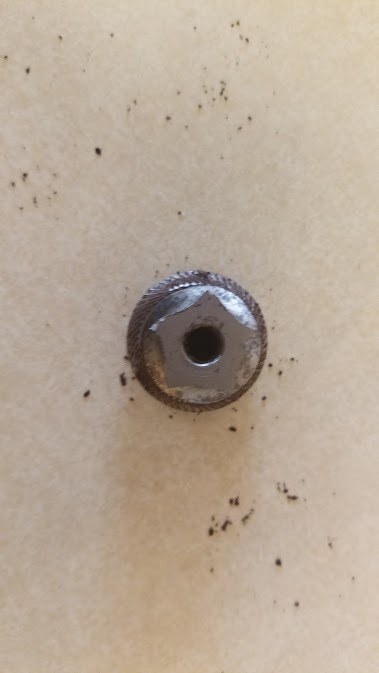 In the photo, there’s the conical burr from my grinder, which I got removed from the machine according to the directions that Pierce provided. There’s an 8 blade plastic paddle below there… can you see it? 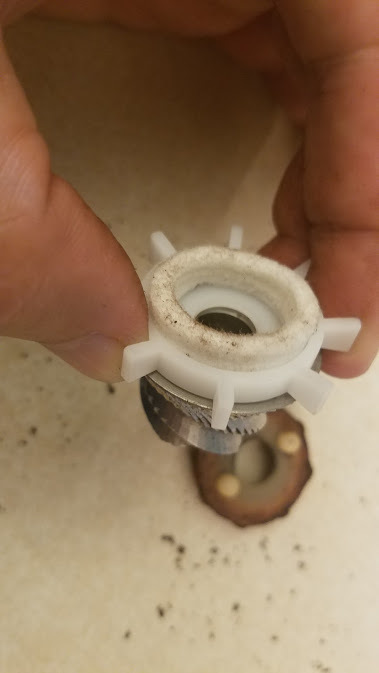 Sure enough, the blades were completely worn, which is why I didn’t recognize the part on their website! The paddle wheel is responsible for sweeping the grounds out of the grinding chamber and through the shoot to the bin. After many years of use (in my case, anyway), the blades had worn down to the point where they just couldn’t push and grinds out! I got the new one out of the package and attached it to the burr. Check out the worn one in the background! Reassembly was a snap. The PDF guides Pierce sent me had plenty of detailed instructions and the whole repair probably took less than 10 minutes. With the grinder back together, I’m now getting “good as new” performance from my machine. I probably should take a cleaning brush to the burrs on a regular basis. I will admit to having lost my grinder brush many years ago and then forgetting about this whole maintenance step. Had I been doing this, I probably would have noticed the paddles wearing down. In my case, it had been so long since I had had the grinder apart (even enough to just inspect the burrs), that I had completely forgotten those white paddles had ever been there! Baratza has won my business. They make virtually nothing from selling me parts like this, because the resources they’ve expended to provide support are far costlier than the revenue they’ve generated from the parts (not to mention the profits). That they still provide support via email in this way, and that there’s someone smart enough to employ Pierce Jens tells me that they’re precisely the sort of company I want to do business with. The final lesson is that I’m probably going to go ahead and order new burrs for my machine as the supply of parts for my grinder is apparently starting to dwindle. Mine are still performing well, but after inspecting them up close, I could definitely see signs of wear that weren’t visible to me prior to completely disassembling the grinder. Alas… I won’t be needing a new grinder any time soon. But when I do, I’ll be buying Baratza. I certainly highly recommend you do the same! Oh… and if you’re having trouble with any Baratza grinders, check out their fantastic YouTube channel, where Pierce shows how to perform any number of repairs! Dude, just saved my grinder….for $5! Fantastic! Glad to hear it, Merle. I appreciate you leaving a comment! Unbelievable. I though something had to be missing under the burr. We ended up buying a new grinder (a toss up between Baratza and another brand), but I refused to give up on my old Barista. Just ordered my paddle wheel (and some other stuff to show my appreciation), and I’m so excited! Only problem is we didn’t buy a Baratza. I’m a customer for life now, given they are not about planned obsolescence or lack of support. So I will order myself the Baratza and give my other new one away! Thanks for posting this! Next PostNext Congratulations to Rod Thomson!